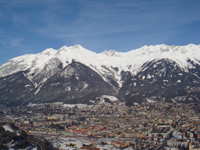 We begin our fullday sightseeing tour of Tyrol in Innsbruck (or, if you prefer, from any other location in Tyrol!). Starting from there, we will first go and visit the castle of Tratzberg with a guided tour of the imperial representative rooms. Next, your driver and guide will take you to the Achensee lake where we will board a lake cruise ship that will take us from Pertisau to Achenkirch. After a quick break for lunch, we will move on to the glass manufacturing city of Rattenberg and visit the famous Kisslinger glass manufacture. Finally, we will enjoy a panoramic tour of the characteristic Alpbach valley before returning to Innsbruck. Comments regarding the tour "A sightseeing day in Tyrol"
Depending on your personal wishes and interests, the program of the full day excursion "A sightseeing day in Tyrol" can be modified by replacing, adding or removing elements. For instance, it is possible to reach the Achensee lake by a nostalgic rack railway instead of travelling by bus, minibus or car. And if you wish to extend the tour, we can include a visit to the Swarovski Crystal World museum, a guided city walk at Hall in Tyrol, a guided tour to the abbeys of Fiecht or Wilten or a panoramic tour of the Zillertal valley.